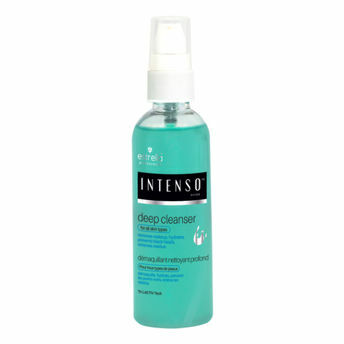 Bid adieu to dull, dehydrated skin with Intenso Deep Cleanser for All Skin Types. A must have in your regimen of skin care, this Refreshing and Natural Cleanser is formulated exclusively for Indian skin. Estrella Intenso Deep Cleanser comes from the house of Estrella, an exotic blend of ancient recipes, tried, tested and proven across civilizations for beauty and wellness benefits. It has handpicked combinations of ingredients, textures and elements for a superior overall experience - and inter-connectedness that your soul will fall in love with. Intenso works to improve skin texture, look and feel and overall well being of the skin with regular use. A leading and popular choice among acclaimed skin aestheticians across geographies - Intenso's home care series is the most sought after care regimen among regular salon going customers. Now available to pamper and care for your skin! Explore the entire range of Cleanser available on Nykaa. Shop more Estrella Professional products here.You can browse through the complete world of Estrella Professional Cleanser .